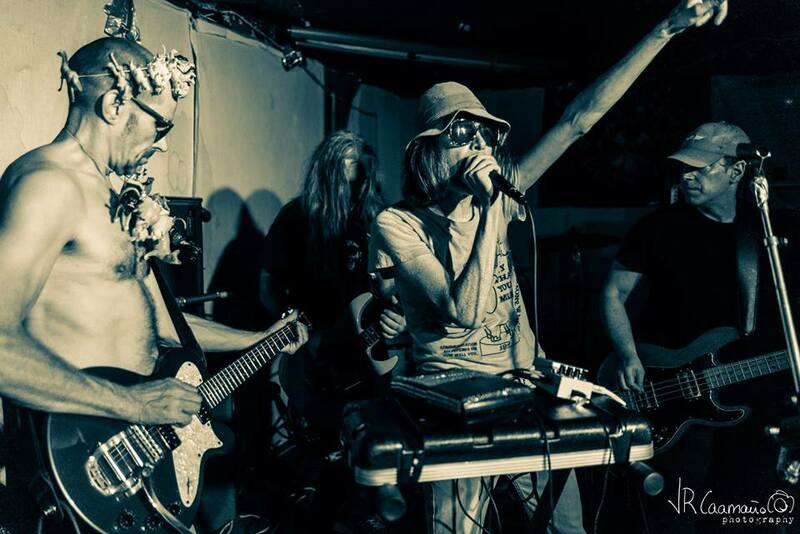 Fans of 1980s/90s psychedelia will no doubt be aware of Terminal Cheesecake, a band so in your face that not even a death mask would stop them from giving you serious attitude; one of those bands who always seemed to be on the edge sometimes tipping over in to the abyss of inaccessibility. Well hold onto your Juju because Terminal Cheesecake is back with its first new album in over twenty years and, frankly, it seems to have been worth the wait. If I were to tell you that the album is on Box Records, home to the likes of Luminous Bodies and Haikai No Ku, and that Gnod’s Neil Francis has been brought in to do the vocals (replacing Gary Boniface) then you begin to get an idea of what this album might be like. The vocals were probably the most convincing part of Gnod’s most recent release ‘Mirror‘, and Francis brings that over to this album right from the opening bars. Be under no illusions though, this is first and foremost a Terminal Cheesecake album, as evidenced by the explosion of sound on album opener ‘Birds in 6/8’. Yet, for the most part, this is perhaps a more accessible form of Terminal Cheesecake; still a band on the edge, but one that stays there and finds a good balance, even as the album slowly yet inexorably fragments. So this is an album that it eminently listenable, but it is not one that is safe and unchallenging…as the unrelenting thump of this track testifies…and testify is what Terminal Cheesecake do! Second track, ‘Poultice’ quickly gets a great psych riff going and really gives your brain something to dig into as it hits you time and again. In a sense this is the most mainstream track on the album, although it is still located well in the leftfield and is a terrific track. Things start getting more interesting with ‘The Winding Path’ which on initial listens feels anything but that. More like a direct injection into the cereal cortex, it mainlines noise and offered the sort of barrage that has you gasping for breath. ‘Dandelions’ opens in a much more calm manner giving some respite from the sonic fuselage of the opening triplet of tracks. Yet it gradually picks up pace with some doom laden beats offset by the sort of edgy guitar which could conceivably smash glass. This is contemporary down and dirty psych at its best and proof that Terminal Cheesecake are a long way from being yesterday’s band. The bizarrely named ‘Mr. Wipey’s Day Trip To Guildford Heaven’ is the sort of track that Syd Barrett might write were he in his pomp today. Full of sinister imagery, offbeat and like the sort of acid trip that would be your worst nightmare if you were on a bad acid trip; yet also tinged with humour, it’s a short but bitter number. that works because adds to the album in a rather strange way and also disrupts its progress in a sense that it allows new ideas in. No exactly a breath of fresh air, more a blast of hyperreality. Palate cleansed ‘Song For John Pt.1’ feels all the more intense than it did as a standalone lead track. Initially sounding like it is rooted in a huge reverbed riff that gradually grows and then disintegrates into a miasma of fuzz and feedback, a decent into the sort of chaos that feels appropriate for out times. After that it would seem somehow inappropriate to play a ‘tune’, which is exactly what happens with ‘Lord Jagged (Terminal Cheesecake Quintet)’ which is a cacophony of sounds which only occasionally seems to have any cohesion to it. This is music at its most free unencumbered by either form or function, make of it what you will. That Terminal Cheesecake are back and relevant says as much about our times as it does the band. This seems to be a fertile time for fresh and innovative music, whether you want it to be psychedelic is your call, that encourages you to think and feel in new ways. Part of that potency if fed by the times in which we live with the gradually fragmenting nature of this album somehow reflective of the twenty years since the band brought us new material. As always Terminal Cheesecake tell it like it is. Be afraid, be very afraid. ‘Dandelion Sauce of the Ancients’ is released on 11th November 2016 on Box Records, and is limited to 500 copies on orange crush colour vinyl with printed inner sleeve and download code. Order direct from the label here.